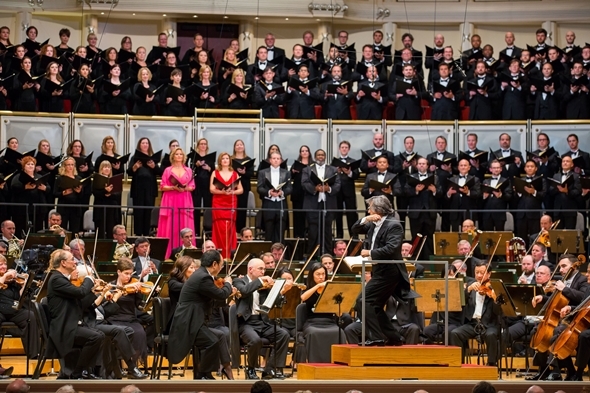 Review: Chicago Symphony Orchestra and Chorus, conducted by Riccardo Muti; with soprano Camilla Nylund, mezzo-soprano Ekaterina Gubanova, tenor Matthew Polenzani, bass-baritone Eric Owens. At Orchestra Hall, repeats Sept. 21 and 23. The cantata Beethoven composed to Friedrich Schiller’s “Ode to Joy” – that is, the grandiose finale to the Ninth Symphony – may be a rousing crowd-pleaser, but it’s also a good deal more. It’s the peroration of a sweeping dialectic on man’s fate, a closely and tumultuously argued essay spun out in wordless majesty for three-quarters of an hour before the first syllable is uttered. 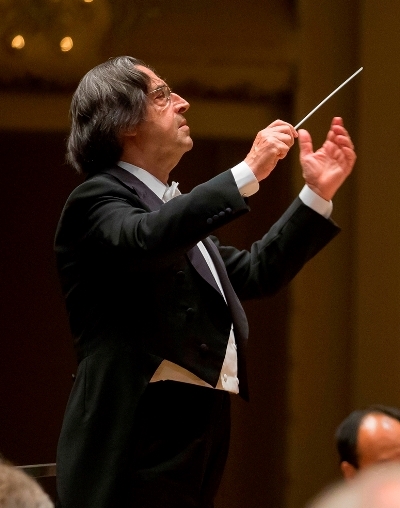 Such was the sum and the magnificence of music director Riccardo Muti’s season opening performance of the Ninth Symphony with the Chicago Symphony Orchestra on Sept. 18 at Orchestra Hall. From its first ruminative stirrings of sound, this was a Ninth of gripping urgency and thrilling philosophical arc. Here was the 73-year-old Muti as both knowing dramatist and blazing intellectual, offering a Ninth Symphony that seemed to take us into the very crucible of Beethoven’s clear-sighted creative process. Chapter by chapter, as if through a sequence of heaving internal dialogues, Muti and his burnished orchestral forces brought the private Beethoven into stunning public view. In the work’s vast opening movement, with its impulsive rhythms and pendulum swings from lyrical light to dread darkness, Muti quickly established the essential conflict between man’s sublime aspirations and his mortal frailty. 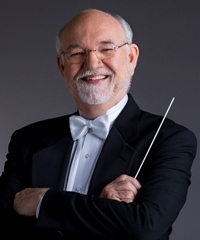 The Chicago Symphony captured this spiritual surge and stress in mid-season form, in finely contoured string playing and woodwind exchanges of almost verbal precision – all punctuated by incisive brasses. The scherzo, propelled by terrifying shots from the tympani, pitched the argument toward the dark side. Here, as in the first movement, Muti’s tempos seemed to be dictated by the pulse and pitch of the unfolding drama. Here, too, the sheer power Muti evoked from the orchestra was matched by playing of consummate elegance and often breathtaking softness. Amid such fraught music, the Adagio of the Ninth seems a perfect miracle of repose. Where, in the whole body of Beethoven’s works, does one find so ethereal an expression of spiritual centeredness? Only the slow movement of the Violin Concerto comes to mind. Muti’s long-lined phrases and the strings’ gentle sparkle produced an effect of cosmic quiescence. And then the big finale, the vocal resolution of this instrumental debate. There’s a long history of criticism of the choral conclusion to the Ninth: that Beethoven turned to Schiller’s ode because he simply couldn’t muster a purely orchestra resolution to his own titanic question. Many years ago, when I was chewing on this issue with composer-conductor Lukas Foss, he made the very good point that Beethoven doesn’t entirely rely on Schiller’s text to get him to the finish line, but rather presses on with the moral conflict in the orchestra almost to the end. Foss noted the catchy military-band variation in the finale that begins with cymbals and spotlights the tenor’s march-like tune: It’s a digression from the sublime to the ridiculous, Foss observed, just the sort of thing Mahler would do early and often. But to be sure, it is Schiller’s text that provides Beethoven’s final, unequivocal affirmation of mankind’s blessed state and what both poet and composer perceived as his natural bond of brotherhood. 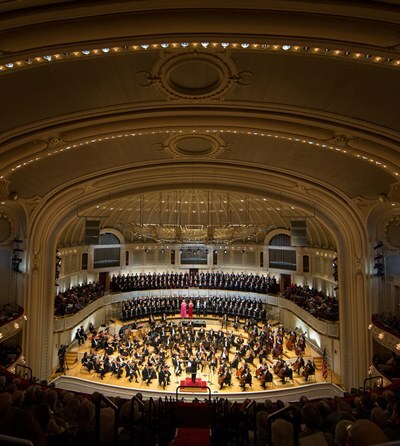 In this, Beethoven and Muti were both well served by Duain Wolfe’s superb Chicago Symphony Chorus, which brought to its singing the same starry shimmer and otherworldly power displayed by the orchestra itself. No less stellar was the vocal quartet of soprano Camilla Nylund, mezzo-soprano Ekaterina Gubanova, tenor Matthew Polenzani – standing in for the originally scheduled Christopher Ventris — and bass-baritone Eric Owens. Whereas conventionally, the quartet holds forth from the front of the stage, Muti moved them behind the orchestra and just in front of the choristers, where these fine soloists became pinpoints of humanity amid the multitudes, literally embraced in word and spirit.